1920 Evil Returns neither engages you nor scares you. The film ends up turning into a comedy instead. 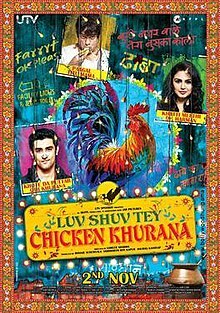 Luv Shuv Tey Chicken Khurana, in short, is delectable feast if you ignore the minor flaws. It has a lot of humour and massive contagious Punjabiyat! OMG Oh My God is an honest film with a strong message which should be encouraged and seen especially for the brilliance of its script and the delightful acting of Paresh Rawal! English Vinglish stands tall on the shoulders of two courageous women, Gauri Shindi and Sridevi who deliver one of the finest films of 2012. A definite watch for everyone. Joker is ham fest at best. A plausible half decent plot, which too gets wasted by lunatic antics and buffoonery. Sadly this time around, the joke is on the Joker itself. Cocktail can make for a decent time-pass watch if you have the capacity to digest the cliched melodrama. Maximum has minimum entertainment and maximum mediocrity. Ferrari Ki Sawaari is a great joy ride if you avoided the minor glitches. A definitely one time watch. It remains true to the Vidhu Vinod Chopra style of films. Shanghai, at just being an expose may not be a complete massy affair but it does make for a compelling one time watch, especially for the outstanding performances. Rowdy Rathore is a heavy dose of Bollywood masala movie which will be loved by the audience who fancy such preposterous outings. But this film is definitely not for the intelligentsia. Rakhtbeej can actually be listed in the series of cult bad films that scarred Hindi cinema. Best avoided! Dangerous Ishhq is definitely very dangerous... to your sensibilities! Beware! Ishaqzaade had the potential to turn into a blockbuster but sadly, the opportunity got wasted. Tezz can be seen for Anil Kapoor and Ajay Devgn and also for the Bollywoodishness of it. For the ones disinterested in these elements, Tezz isn't the film for you. Life Ki Toh Lag Gayi is best avoided unless you derive some evil pleasure in punishing yourself. Chhodo Kal Ki Baatein has the heart in its place but gets mired by faulty execution. Agent Vinod is style over substance. A little mish-mash and a little rehash.